I’d heard about Sustainival for years and I’ve met co-founder Antoine Palmer before. But his own description of the carnival didn’t prepare me for the real deal. Before seeing Sustainival I was expecting to see a few kiddie rides and people sitting in small tents talking about the environment. When I arrived at Sustainival in Edmonton, Alberta I was astonished at the scale of the event. The carnival covered the large park-like setting at the Servus credit union site across from South Edmonton Common. It featured a full-sized Ferris wheel, the Zipper, a Graviton loud carnival music, games, and all the smells and sounds of a full-sized carnival. “We are the world’s first green carnival. Basically we have about a 2.5 acre midway here running entirely on renewable energy,” says Antoine Palmer, co-founder of Sustainival. To illustrate the point, Palmer stands beside a large glass case full of canola seeds. “This silo represents 7,000 litres of canola seed which is a big part of the energy used to run this site. We run about one megawatt of power to run all of these rides and all of that is generated by renewable energy. Mostly waste vegetable oil converted into biodiesel so it’s a lot of power and a lot of fun,” says Palmer. When you are spinning at three times the force of gravity in a ride powered by energy generated from burning French fry oil “You walk away with renewable energy in your bones,” chuckled Palmer. 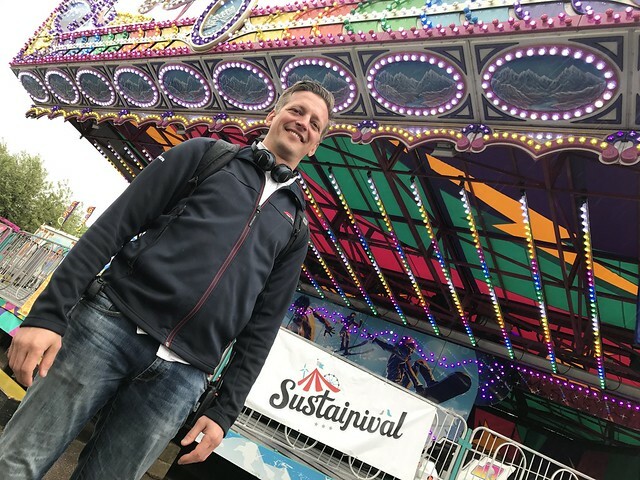 Sustainival is indeed a full-scale carnival complete with all the smells and sounds, but it’s also absolutely infused with environmental messages about building a sustainable future. The answer of course is the Mosaic Centre, a 30,000 square foot office building that powered 100 per cent by solar energy and heated and cooled with a geothermal system. The kids can win prizes, including a super cool electric powered drift bike, which is also one of the dozens of rides available. Sustainival works with local partners such as the City of Edmonton to run Sustainival. They bring support, sustainability messages and education to carnival goers. The City had displays on Edmonton’s amazing waste management system, they were giving away copies of their Green Home Guide and they were there talking to Edmontonians about climate change and energy transition. There were also a dozen community and sustainability groups there including Sustain SU from the University of Alberta. Sustainival got its start at the Freezing Man electronica festival in 2011 in Edmonton. “We brought four carnival rides to this Freezing Man concert, indoors at the Northlands Expo Center, and we powered them on biodiesel, and it was amazing. It basically made the show,” says Palmer. The event was hosted by the Chamber of Commerce and armed with great feedback, and tons of media attention, Palmer and Hundert went on to produce 20 carnivals including events in B.C., Calgary, Fort McMurray and even Little Rock Arkansas. This year Sustainival produced events in Lethbridge, Edmonton and Fort McMurray in Alberta. Then Palmer got interested in economics, community development and the whole idea of sustainability. “For me, it’s a design problem. It’s like, how do you meet everybody’s needs in a way that is complete, and whole, and sustainable? All the pieces had to fit together and work in harmony,” says Palmer. “We have to appreciate that we are being hosted by our ecosystems, we’re basically guests, and we’re dependent on the ecosystems that host us. And we also significantly influence the ecosystems that host us. So, sustainability is about having a win-win relationship with the environment,” says Palmer. Today Palmer is an entrepreneur, and Sustainival is still a big part of his portfolio and it just might be one of the most unique ways of engaging people in a conversation about sustainability that we’ve have ever seen. Take a ride on the biodiesel powered Graviton, if you get the chance! At the Edmonton Sustainival event the Electric Vehicle Association of Alberta put on a electric vehicle car show. The Alberta Canola Producers Commission were a sponsor along with Red Rock Developments and the community partners with booths included: Edmonton Food Bank, Saskatchewan Watershed Alliance, Alberta Beverage Recycling Corporation, CJSR Radio, University of Alberta Sustain SU, Canadian Parks and Wilderness Society, the Local Good, ATCO Energy, Virgin Radio, Servus Credit Union and the Yellowstone to Yukon initiative.